Reflections on the bar mitzvah of the oldest son of Rabbi Eitam and Naama Henkin HY”D. 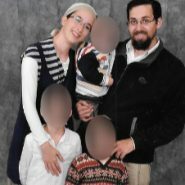 Three and a half years ago on Succot, Rabbi Eitam and Naama Henkin were driving home when they were brutally murdered by Palestinian terrorists in front of their 4 young children. My husband, Joshua, is a program director at Nishmat, founded and directed by Eitam’s parents, Rabbi and Rabbanit Henkin, so over the years, I’ve been able to watch those orphans growing up. In the wake of this unthinkable tragedy, it’s been awe-inspiring for me to witness the dedication and self-sacrifice with which the Armonis, Naama’s parents, and the Henkins have raised their grandchildren. And yesterday, three and a half years after those 2 Palestinian terrorists did everything they could to destroy this beautiful family, the Henkins and the Armonis celebrated, b”H, the bar mitzvah of Matan Hillel Henkin, the oldest of Eitam and Naama’s children. And last night, at the bar mitzvah in Neriya, I was blown away by this incredible bar mitzvah boy. Matan Hillel comes from a long line of distinguished rabbis. His great-great-grandfather was Rabbi Yosef Eliyahu Henkin, widely recognized as one of the greatest rabbis of the 20th century. And Matan’s grandfather, Rabbi Yehuda Henkin, has continued the family tradition as a leading halachic thinker. Matan’s father, Rabbi Eitam HY”D, was well on his way to becoming the next in line. Before he was murdered at the age of 31, Rabbi Eitam had already published several books on Jewish law. After the terror attack, Naama’s parents transported Rabbi Eitam’s entire library of holy books to their home in Peduel. And Matan has obviously made very good use of it. Matan’s talk at the bar mitzvah, which he insisted on writing completely on his own, without any assistance, was nothing short of remarkable. Delivered with confidence and clear mastery of his subject, I felt like I was listening to a 30-year-old rabbi and not a 7th grader. Like I was listening to Matan’s father and not his father’s son. Matan Henkin’s parents were inhumanly taken away from him and his siblings when he was still a young boy. But the Torah and mitzvot his murdered father and mother loved so much and devoted their lives to are the same Torah and Mitzvot that Matan is accepting upon himself and dedicating himself to as a bar mitzvah. Over the past two thousand years: Crusades, Inquisitions, pogroms, a Holocaust, and today, ongoing terror attacks against us by our enemies have claimed millions and millions of Jewish lives. But our love for and loyalty to the Torah has enabled the survival of our ancient nation. With the Torah, we are Am HaNetsach, the eternal people. May the Henkin and Armoni families be blessed from now on with only happy occasions. As well as tremendous nachas and pride as they watch their grandchildren growing up, continuing, G-d willing, in the footsteps of their idealistic and determined parents who would have given anything in the world to be able to watch them grow up and to have been celebrating last night with their precious firstborn son, Matan Hillel. Thank you for sharing this wonderful milestone. Yet another lesson that adversity doesn’t have to break us. As a nation individually and collectively we’ve been through so much and yet we continue to forge ahead. Matan Hillel is a shining example to all the youth of his generation. Netzach Yisroel Lo Y’shaker….Am Yisroel Chai!